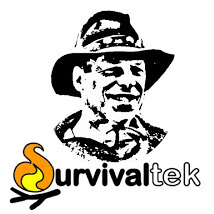 Survival often hinges on preparedness. Folks who are prepared for emergency situations often carry items in their pockets or on their person that are in effect tools for communication, construction, repair or first aid. These items are known as “Every Day Carry” or EDC. I carry a number of items on a key ring and in my wallet. My wallet holds documents, cards and cash that can be critical for purchases like gas, fares and food. Unfortunately, when you’re out and about in emergency situations your path may result in personal loss by robbery where your wallet is taken from you, leaving you without funds for your immediate needs. One simple solution for monetary backup is by carrying extra cash in an empty lip balm stick. 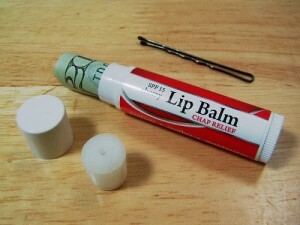 You can make your own cache by removing the cap of the lip balm and elevating the wax out completely. The cylinder of wax will have a plastic cup at the end and you can gently remove it. Then, fold your currency in half lengthwise. A hair pin can be slipped over the bill’s midpoint and rotated like a spindle to create a small tube which in turn can be placed into the empty lip balm container. When the cap is replaced, no one will see the contents or suspect your lip balm of being a cache of currency. For an even more hidden appearance you can cut off the wax just above it’s plastic cup and replace it in the tube over the currency so that it appears completely normal when the cap is removed. In regards to the wax, in a hot environment it might melt and moisten the contents that are hidden, but it doesn’t invalidate the currency. It can also be used in a number of other ways such as for it’s original purpose, or to float an improvised needle compass, to enhance kindling for making a fire, or for any number of other things. So consider taking that extra step of monetary backup. It takes very little space and could just save the day in an emergency. This entry was tagged BOB, Cache, DIY, EDC, Lip Balm, Tools, Travel. Bookmark the permalink. A few years ago, my daughter went to a conference in DC, where she had to stay at a dormitory with 100 other girls. We rolled her money in a tampon case.